Put the Game with some Muscle. You golf game just got a whole lot stronger. Get some Peace, get some love and show some muscle! This 60’s retro muscle car design is as powerful as they come. 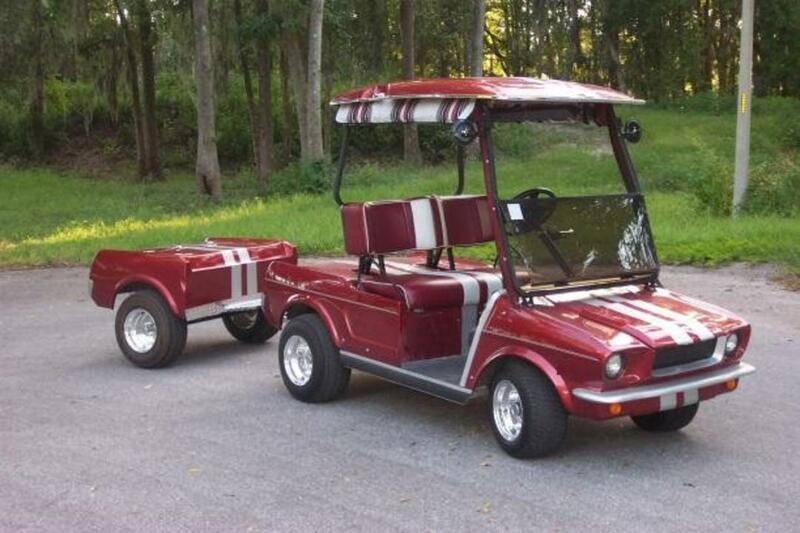 This kit is made to fit a Club Car DS and Precedent. Kit includes front and rear lights, working hood and trunk lid, two sets of hinges pre-installed. Kits are professionally laid to ensure you get the best quality fiberglass kit available. All kits are pre fit with design lighting, hardware and plastics available. For an extra fee this body kit can be fitted to another golf cart design such as the EZGO, see additional options for details. Choose from a multitude of additional upgrades as well. ** Models shown in photos may have optional accessory installed. Designs may vary slightly from images, each kit is custom made to order. Fitted cart bodies may require modifications depending on chassis. Kit comes unpainted, $95 crating fee, product is shipped freight only.